Boston's Chinatown is a neighborhood full of good restaurants, many of which are concentrated along Harrison Avenue, Tyler Street, Hudson Street, and Beach Street. Some very good dining spots can be found on other streets as well, and one eatery is, well, not exactly IN Chinatown. Indeed, Hei La Moon, a mostly little-known restaurant and dim sum house, is located on Beach Street, but it resides on the other side of the surface artery from the main part of Chinatown, really more in Boston's Leather District than in Chinatown itself. And while this is a sign that Chinatown has been spreading out a bit over the years, it is still close enough to the heart of Chinatown to be easily walkable from the main part of that neighborhood, while being just far enough away to be a bit of a hidden gem (albeit an enormous one). From the people in relatively formal clothing who welcome diners at the door to the waiters and waitresses in uniform, Hei La Moon is different from many of the more informal cheap eats restaurants found in Chinatown. Located in one of the many old buildings that make up the Leather District, Hei La Moon is absolutely huge inside, with the ground floor having a sprawling main section that stretches a good distance to the back and a smaller and slightly more intimate area by the front windows, while a similarly large basement section fits many more patrons. 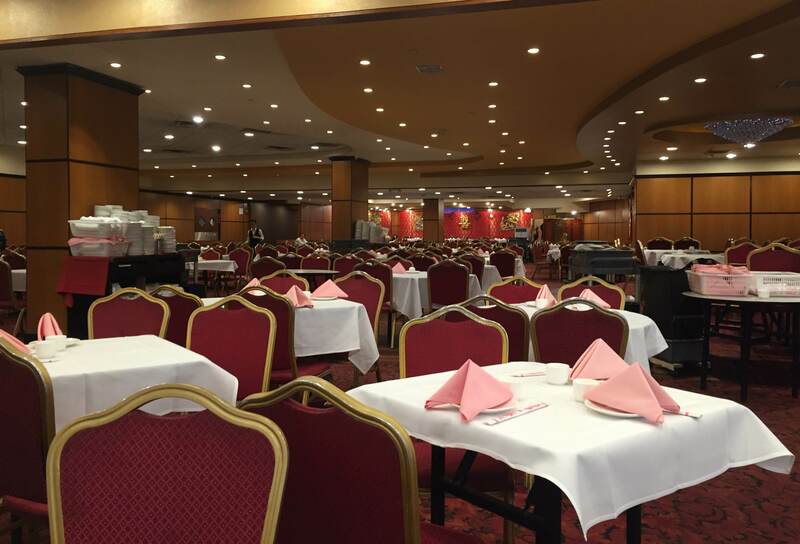 The impressive amount of space makes it perfect for dim sum (and it can indeed get packed on weekends), but it also has appetizers and entrees for lunch and dinner as well. As indicated above, there are basically three menus at Hei La Moon; lunch and dinner menus that looks a lot like those at other Chinese restaurants, and a dim sum menu that mostly features more authentic Chinese items such as shark fin dumpling, lotus seed bun, pork porridge, taro shrimp, steamed chicken feet, coconut balls, sweet jelly cake, and much more. For those looking for more Americanized dishes, items such as wonton soup, hot and sour soup, kung pao chicken, three stars fried rice, spare ribs, a house pan-fried noodle special, sizzling chicken in black bean sauce, seafood lo mein, Peking duck, and more are available, with the hot and sour soup and pan-fried noodles with chicken, shrimp, roast pork, and veggies being particularly good. Hei La Moon is indeed a rather interesting spot, as it feels as big as a football field and remains mostly under the radar, especially to those diners who don't typically do dim sum. It may not be quite as easy to find as restaurants in the heart of Chinatown such as New Jumbo and Peach Farm, but it is almost within sight of these eateries and is often less crowded since it is just a little bit off the beaten path. Copyright © 2004-2017, Boston's Hidden Restaurants (www.hiddenboston.com).